I've been running for the past 8 months and plateaued quite early. One problem is the strength of my legs. It is difficult to raise my legs. How can I (a) strengthen my knees and (b) strengthen the upper thighs, front and back. I'm running up to 20 km at a slow speed barely more than a shuffle. Thanks for your running training question about leg strength. I would have liked to learn a little bit more about what you consider your stagnation to be. Is it that you don't see yourself getting faster, or do you feel you are getting slower? Another question would be what your typical running week looks like currently, is it 20km most of the time, do you do some shorter runs as well, what is your total mileage in a week, etc. I would not despair just yet. It is quite normal that you find yourself going in leaps and bounds. For many people it takes quite a bit out of them to build up their mileage. They find that as they are building their mileage they are actually not really improving their speed that much. All the energy goes towards increasing the distance, not to increasing the speed so to say. They find that when they lower their overall mileage and start focusing more on so-called quality workouts, i.e. tempo runs and interval runs, that they start improving their speed. It is also these types of workouts that I would encourage you to do to make your upper legs stronger. Other worthwhile exercises to consider are plyometric exercises (just google "plyometric exercises" and you should be able to find something) and intervals on the exercise bike. I have been having a little bit of trouble with my medial ligament recently due to a crazy move when playing squash and have spent quite some time on the bike due to this. Especially when you push up the resistance and then do slow rotations while you are up from the saddle you really start feeling those upper legs after a few minutes. * then 2 x 4 min high resistance, out-of-the-saddle w 2 min recovery. It's thirty minutes but leaves you bathing in sweat and with burning legs. 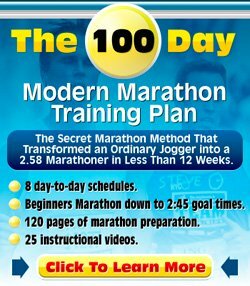 So, in summary, I hope you will find that you will get stronger and faster when you start doing some faster workouts and reduce your overall mileage a bit. If you find that does not work sufficiently I would encourage the cross-training activities described above for extra stimulation of your legs.